I wrote a few weeks ago about a package exchange I had signed up for via the Oh Hello Friend Blog. I had great plans and I think I actually managed to pull off my plans/ideas. For a while I have been seeing neon with neutrals and I love the look. I think Leslie Shewring showcased the neon/neutral look the best in her Tokyo and Neon post in August this year. I found some great neon pink ribbon at Spotlight which was just what I was after - super vibrant and awesome. I decided I would use it with some brown kraft paper but it just wasn't quite enough, looked a little plain. After some messing around and trial and error I decided I wanted to add some interest to the paper. 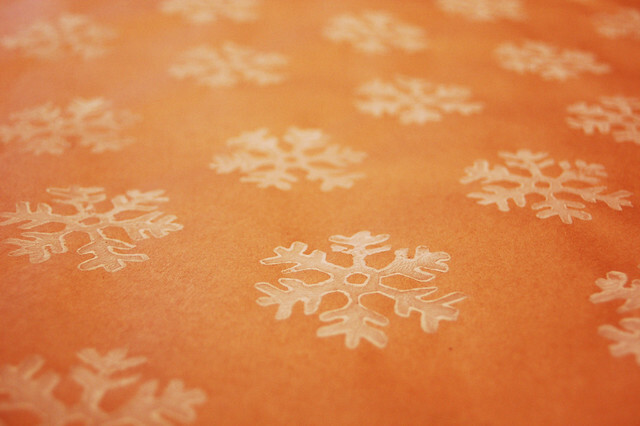 As a lover of all kinds of printing techniques, I decided I would carve out a snowflake motif and use that to stamp the kraft paper. It worked really well and just the pop that it needed. I didn't manage to get a very good photo as it was late and there was no natural light. Still you get the idea. Carmen my swap buddy took a MUCH better photo, check out her super lovely post about my package and gifts.All packaged up inside was a cool print from Dawn Tan, some tags from super ace new packaging company Blank (I bought a tonne of stuff from them at the Melbourne Design Market earlier this month). Oh and also a little pack of postcards from the awesome Yellow Owl Workshop which I got from Notemaker a while ago. All in all my package was a hit Carmen LOVED it and I loved putting it together. I look forward to doing another one soon.